Navisphere®, our global technology platform, provides you with visibility to all transportation activities in one online interface. Available in all regions and multiple languages, you gain access to a configurable and scalable TMS technology solution without significant upfront capital investment in infrastructure and support. Deployed via the cloud, Navisphere is a transportation management system that offers planning, execution, business intelligence, and freight payment capabilities with state of the art disaster recovery support. Whether your supply chain network is regional or spans the globe, Navisphere enables you to see the details of your operations and logistics processes while gaining control of your supply chain. Our optimization tools dynamically consolidate orders to create efficient routing and scheduling plans for complex, multi-leg shipments. We achieve savings by increasing utilization, updating route sequences, and optimizing pool points and cross-docks. Rate assignment at time of tender increases invoice accuracy and eliminates costly paperwork. We allow carriers to accept known charges and submit unplanned accessorials in real-time, allowing customers to approve/reject before billing is completed. Route guide automation ensures accuracy to procurement awards and captures the compliance for robust carrier scorecards. Our TMS technology supports multiple tendering techniques, such as by cost, rank, percentage, region, lane, warehouse, or postal code. Carrier broadcast functionality and our spot bid tools allow customers to send out mini-bids on a shipment-by-shipment basis quickly and seamlessly. Our dock scheduling tools optimize dock configuration, help alleviate dock congestion, and avoid detention charges by having warehouses leverage loading/unloading guidelines and times with carriers. Our yard management tools coordinate trailer and dock appointments and manage trailer inventory. It provides visibility into a variety of transportation activities like trailers, loaded trailers, and departed shipments, which improves productivity and reduced detention charges. Navisphere management tools monitor in-transit events. Our TMS documents the events, updates scorecards, and routes the information accordingly. These measures reduce cost, improve service, and expedite communication across your supply chain. Our business intelligence reports are configured for customers to receive instant responses to queries and analysis. You can gain access to strategic cost and service insights at the business unit, shipment, and SKU levels to improve decision-making. Our auto-pay technology reduces costs by streamlining and automating the invoicing/billing process, which improves accuracy and satisfaction. Our payment models provide customization, versatility, and visibility to your carrier processing. At its core, our technology is order—centric—we support all types of freight services and we have the ability to integrate seamlessly with existing ERP, order management, warehouse management, and transportation management systems. Navisphere® strategically impacts supply chains around the world. From global visibility, comprehensive optimization, and actionable intelligence to broad connectivity and trusted performance, we manage all freight services across all regions while proactively improving your workflows and achieving your goals faster. We put a premium on user experience and making our interfaces highly intuitive and easy to use. Through seamless integration with suppliers, distributors, and carriers - you can improve transportation management, enhance supply chain visibility, and seamlessly exchange shipment and financial information with all of your trading partners. 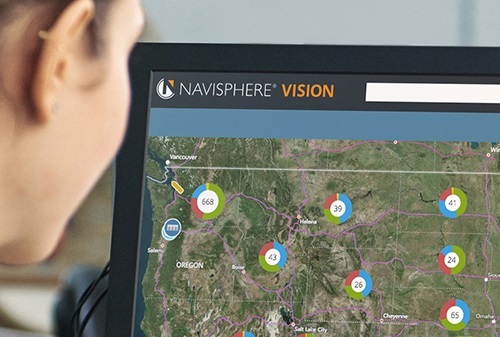 Navisphere® Vision helps you see, know and do more with your global supply chain. It provides real-time order and shipment information, proactive alerts about external factors that can disrupt your supply chain, and predictive and prescriptive analytics. Make smarter business decisions, quickly respond to the ever-changing landscape, and manage potential supply chain disruptions - all from a connected TMS technology platform.